Carte du Mexique ou de la Nlle. Espagne Contenant aussi le Nouveau Mexique, la Californie, avec une Partie des Pays adjacents. 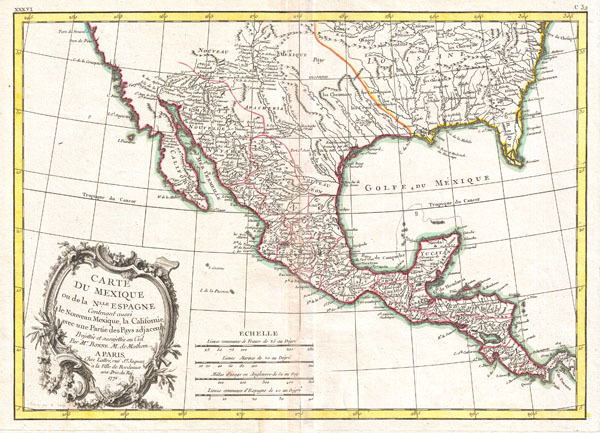 A beautiful example of Rigobert Bonne's 1771 map of Mexico and Florida. Covers from Baja California eastward to Florida and Carolina, extend northwards as far as the mouth of the Chesapeake Bay and southwards to Panama. Bonne, being a very cautious cartographer, abandons many of the fictious elements common to many period maps of this region, thus most unexplored areas are left blank. Being primarily a map of Mexico and the Spanish holdings in North America, this excellent map details the various Mexican states naming countless towns, villages, and haciendas. The map extends northward into the vast and largely unknown American West. Identifies numerous missionary stations along the Rio Bravo or Rivera du Nord (Rio Grande) extending well northing to New Mexico towards Santa Fe. Also names the various American Indian groups who traded with the French in Louisiana. Southern Florida is rendered as an archipelago in a primitive attempt at describing the Everglades. Drawn by R. Bonne in 1771 for issue as plate no. C 32 in Jean Lattre's 1776 issue of the Atlas Moderne. Rumsey 2612.074. Phillips (Atlases) 664. National Maritime Museum, 215.